Reading a document in PDF format is quite handy, however, PDF documents are not meant for editing or making changes frequently. Also, there are times when you may need to convert a PDF document to some image format such as PNG. A PNG (Portable Network Graphics) is a file format that aids in data shrinkage. It is widely used on the internet for making frequent changes to images or text. When it comes to exporting a PDF file to PNG file, it is best to have a tool that is sturdy in performance. 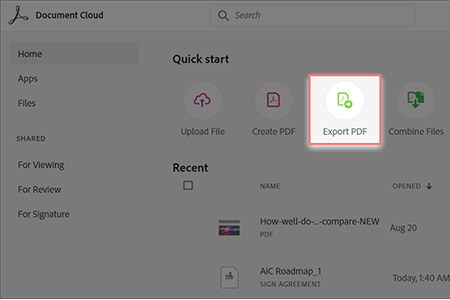 Now, there are two ways to export PDF to PNG and we will explain you both in the subsequent sections below. 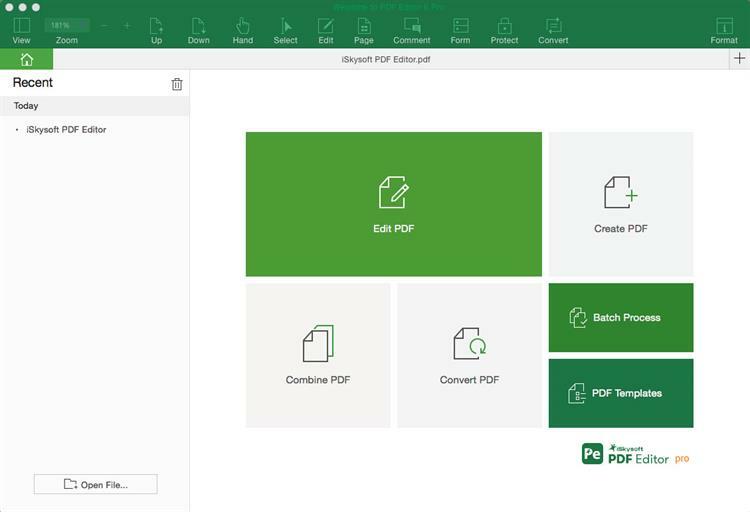 The easiest way to Export PDF to PNG and save time is by using a brilliant software such as the iSkysoft PDF Editor 6 Professional for Mac (or iSkysoft PDF Editor 6 Professional for Windows). It’s a one of a kind software which is also compatible with the latest MacOS High Sierra. 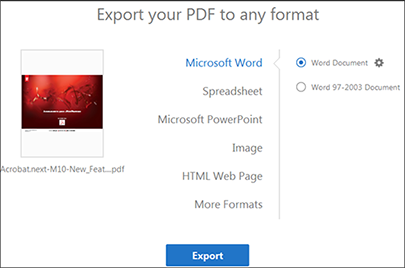 It utilizes advanced technology to export and convert PDF files to other file formats such as PNG, Word, Excel, PowerPoint, JPG, HTML, EPUB and many more. 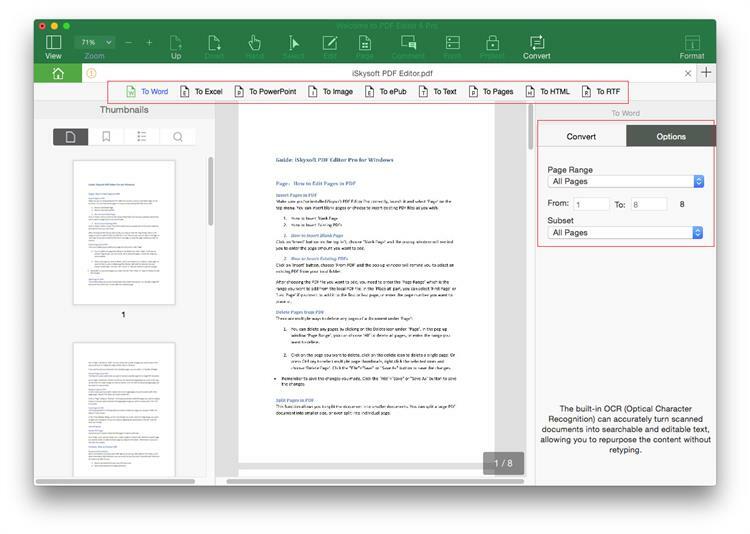 Not only can you create PDF from multiple PNG files, but you can also use it to edit your PDFs, add watermarks, add notations and even digitally certify, sign and verify PDFs. You can also use this marvelous PDF Editor to fill out forms on any PDF document. Visit the official website of iSkysoft and from there download and then launch the program. From the main interface, click on "Open File" option present at bottom of the page and import your PDF. 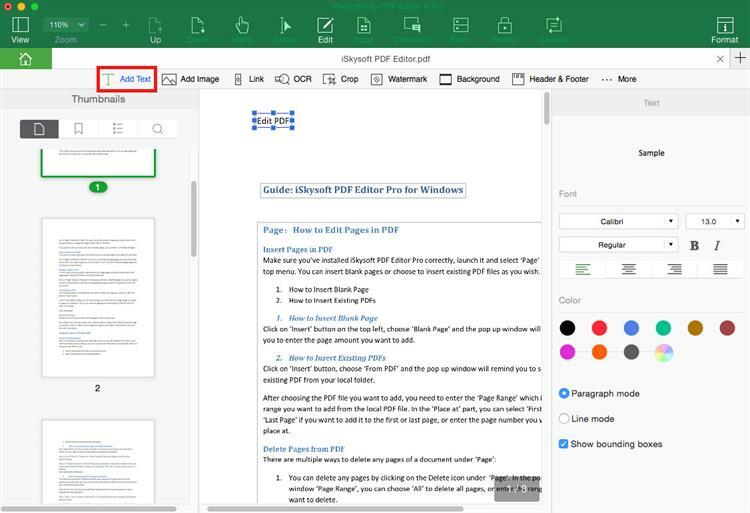 To edit the PDF, select the "Edit PDF" option, then proceed to make necessary changes to the PDF pages, image, text, or use the add, crop, or watermark feature etc. To convert the PDF to PNG, first, start by selecting "To Image" after hitting the "Convert" button. Then continue by selecting the desired file format, that is PNG, at the "Convert" dialogue box. To configure any settings, use the "Options" tab and then press the convert button to complete the process. iSkysoft PDF Editor 6 Professional for Mac (or iSkysoft PDF Editor 6 Professional for Windows) is the most useful tool while dealing with all PDF editing task, and it has become quite a popular tool in a very short span of time. It not only comes with the ability to create PDF from multiple PNG files, it also enables you to create PDF files into any other formats such as EPUB, RTF, HTML. The software has been engineered to seamlessly edit PDFs at a remarkable rate. There are regular updates and upgrades to ensure the software runs at its peak. It’s a unique software with a concise appeal with a design that is simply fascinating. iSkysoft PDF Editor 6 Professional is the ultimate solution to export from PDF to PNG with many more sensational features, such as securing your PDF with a password and sharing the PDF etc. Editing- Effortlessly edit PDF files and images. Conversion- Convert PDF files to several file formats such as; EPUB, RTF, HTML, images. Processing- Batch execution of file conversions and extracting data. OCR (Optical Data Recognition)- Redact PDF files to get vital information. Bates Numbering- Assign labels to PDF files for simpler organization and indexing. Adobe Acrobat is an awesome tool to use to export PDF to PNG on Mac. Adobe has been in the industry for a long time and you can thus be sure that they will deliver when it comes to editing PDFs. It’s a good and reliable PDF editor that has got several unique features. Step 1. First of all, you would have to download, install and launch Adobe Acrobat. Step 2. Then, click on "Tools" and from the available options choose "Image". Step 3. After that, it will ask you to select a format. Select "PNG"> then press "Export". Step 4. 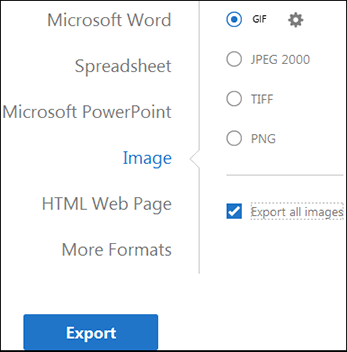 You can click on the gear icon to configure the settings for the selected file format that is PNG. Step 5. Finally, choose the final destination and save your image file in the desired file format. Opening PDF. With the current versions, especially on Mac, PDF files do not open due to enhanced security in the software. Dynamic stamps. The stamps in a Shared Review PDF are not visible. Cloud Integration. Sign-in to Acrobat.com is a problem mainly to those who have Internet Explorer 7 and installation of third-party extensions especially on Mac may cause the software to crash. Deployment and Customization. Some user also says that they have issues with the activation of their copy of Acrobat or to enter the Adobe ID. Copyright © 2019 iSkysoft. All Rights Reserved.